The Brothers Grimm are famous for taking age old stories, handed down through generations by word of mouth, and putting them down on paper. Everybody at some point in their lives has seen an interpretation of at least one of the classic fairy-tales, whether in a story book, a production or a popular Disney adaptation. After coming across the book at a very reasonable price in a Algoritam, lovely bookshop in Dubrovnik, I felt it was about time to take a look at the collection to see just what has made them such an inspiration for literature and popular culture. For a collection that is constantly being retold and modernised, the plots are old fashioned and very repetitive. Most of the fairy-tales comprise of a King who sets a number of seemingly impossible challenges for prospective husbands of his daughter, who just so happens to be the most beautiful woman in the entire kingdom – if not the world. The man who manages to stay alive and complete these challenges – usually with help from magical toads, wrinkly old people or talking animals – gets to marry the princess. I am not ruining anything when I say that normally there is a big wedding at the end, as well as an ‘and they lived happily ever after’. I shouldn’t expect anything more from children’s stories. But these fairy-tales are not really all that child friendly. You may be familiar with the story of Cinderalla. The Brothers Grimm version, Ashputtel, is far more gruesome than the popular Disney animation. When one of the ugly step sisters tries on the slipper only to find her toe is too big, the horrible step mother cries, “Never mind, cut it off” and hands her a knife. This leads to lots of blood and a rather disgusted Prince. I must admit, I quite liked this horrific surprise, which I had not expected. Of course, we still got the ‘happily ever after’ ending, but it was nice to have the added blood and gore, to spice things up a little. Another favourite of mine is the story of a couple of kind hearted little elves who come in the middle of the night to help an old shoemaker and his wife. Aptly named, The Elves and the Shoemaker, it is a loving tale about generosity and selflessness. With yet another happy ending, this was a nice, uplifting fairy-tale, which made me want to rush out to perform my very own random act of kindness and spread the love. Apart from the odd comical moments of children killing their step parents, or old witches turning into goats, the rest of the collection was either the same story but slightly altered or simply boring. I don’t even want to think about the tales of The Young Giant and The Tailor which seemed to be a long rambling tale about nothing in particular. And don’t get me started on The Adventures of Chanticleer and Partlet. So it has not been one of my favourite books to read, and I was thankful that they were only short stories so that I could read a more interesting book at the same time. If you are considering buying this book, it might be an idea to choose an illustrated copy with colourful pictures of all the magical creatures it contains. At least then you will have a nice book, even if the stories aren’t always that enjoyable. If you are interested in buying the book, you can always click the picture below! I agree with you on the repetitive front – but the thing is, the fairy tales are really the result of the Brothers’ journeys around Germany collecting the stories people were telling. To me, it’s not meant to be read as “a book”, but rather one story every now and then. Even so you have to account for what those tales are: didactic (as Beverly rightly mentioned) stories told by simple people some centuries ago. I don’t even think they’re originally for children, although back then people were a lot less delicate about children hearing gruesome stories (there is a 19th century German didactic storybook explicitly intended for children, “Struwwelpeter”, where the characters die in all kinds of horrible ways as punishment for being “bad”). Rather I imagine something more like a gathering of the extended family of farmers on a winter evening as the kind of setting in which these stories were told, with adults as well as children present. Before reading the Fairy Tales, I was aware that it was more about the capturing of stories that had been told for centuries, than the actual tales themselves. Maybe I made a mistake reading it all pretty much in one go. I suppose I was just hoping that, as well as being an interesting and important part of history, the tales would be an enjoyable read conjuring up magical images! The stories have obviously been the basis for many great stories, poems and films since, so I am not completely unhappy with them! Hi there – thanks for your ‘like’ on my Birdwatchers book review! I enjoyed this review, it’s a topic I am particularly fascinated by. (Yes, I’m a children’s lit geek!) Bravo for sitting down to read it cover to cover! I’m sure it’s more usually read in bits rather than straight through. The Grimms originally collected the stories mainly as a sociological document – to record them all before they disappeared – so the intent was more to be scientific than to be entertaining. That said, they weren’t actually all that scientific at all about it, because the brothers edited heavily, making many changes to the stories, often upping the violence to give the tales a more severely moralistic bent. Thank you for the comment! After looking at your post on fairy tales, I think it looks as though the history behind them is actually more interesting than the fairy tales themselves! Brilliant post by the way, thanks for the link! for that very reason the narrative structures and plots are so simple, otherwise it would have been high-fantasy like LOTR which obviously is not for small children. I don’t mind them being simple, it is the fact that they are so repetitive that annoys me! I had really wanted to like them as well and was really looking forward to reading it…Maybe I had too many expectations. I have seen the movie featuring Heath Ledger and Matt Damon. Dint like it that much..
No, I wasn’t particularly impressed either! Oh certainly! I have an old leather-bound, illustrated edition and it’s so lovely. Thanks for posting this. 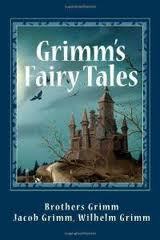 I have to say I agree with your remark about the original fairy tales being a somewhat insipid and redundant read. However, I think they are worth owning, if only because their content is didactic. And I prefer them to many of today’s derivatives — their gruesomeness makes the simple tales a bit more tolerable than the overly flowery Disney versions! I think if we could get rid of some of the more boring and repetitive stories, and kept only the good ones it would make for a much better book! I do wish I had bought one with lots of pictures as well. I think fairy-tales need a bit of colour!